The Bengal cat is a distinct, unique breed of spotted domestic cat derived from the ancestral crossing of a domestic cat such as an Abyssinian, American Shorthair, Burmese or Egyptian Mau with an Asian Leopard Cat. The name "Bengal cat" is derived from the Latin name of the Asian Leopard Cat, Feline Bengal catensis. The domestic Bengal cat has inherited the exotic, stunningly wild spotted pattern from the Asian Leopard Cat, found in the wild in central Asia. This beautiful breed of cat is very loving, affectionate and friendly whilst retaining the uniqueness of it's wild ancestors. The main credit for this breed is given to Jean Sudgen of the USA. Jean Sudgen crossed a black shorthaired domestic cat with a female Asian Leopard Cat in 1963. Offspring were produced proving that a second generation was possible. Further experiments were interrupted due to a death in the family. Later in 1975, Jean Sudgen, now Mrs. Jean Mill, acquired eight female hybrids from a geneticist called Dr. Willard Centerwall, who had been involved in a breeding program where Asian Leopard Cats were crossed with domestic cats as part of a study of feline Leukaemia. Jean Sudgen Mills began again to further the new breed. This was the beginning of the exciting and exotic Bengal cat breed. Finally in 1984, the domestic Bengal cat we know today became recognised by the International Cat Association. 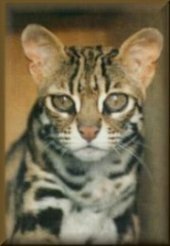 Jean Mill is based today in California and is still breeding Bengal cats. She is also actively involved in the future of the Bengal cat breed. For more information about Jean Mill, please visit Jean's Website. The Bengal cat is a medium to a relatively large shorthaired exotic cat. Bengal cats vary in size with the male between fourteen to twenty pounds and females slightly smaller at ten to twelve pounds. Bengal cats are very muscular cats with long bodies, thus appearing larger. They are also sturdy and substantial in appearance. Heads should be wild looking and formidable. The face should have a feral expression with small rounded ears, intense facial markings, and pronounced whisker pads. Careful selection of breeding ensures that the Bengal cat remains loving and friendly with a superb temperament, whilst retaining a strong physical resemblance to it's wild ancestor. The Bengal cat can be very mischievous and boisterous. They are active cats always ready to play. You can easily leash train them, and teach them to fetch, and play other games. They are also very vocal cats, always eager for human companionship and approval. The Bengal cat mixes well with children and other animals. With their sleek, soft coat, which is more like a pelt than ordinary cat fur, sufferers of allergies claim that the Bengal cat brings out fewer reactions. The Bengal cat is also unique in that these cats actually love and enjoy water. They will play for hours with a slightly running tap. The Bengal cat will delight children and adults alike with its playful antics with water.